Microcellular vinyl construction for excellent comfort. Pebble pattern gives non-directional traction. 9.5mm thick, reduces heat loss and sound. Bevelled edged to minimise trip hazards. Easily cut to fit individual workspaces. In plain black or with yellow edging for safety. Available in 2 mat sizes, rolls or cut lengths. N.B. Cut lengths must be ordered in multiples of 1m. * Denotes minimum order quantity 2m length. Standing on your feet all day can cause you to become tired and strain your body, tiredness causes a lack of concentration which is dangerous in many environments leading to accidents occurring. Our economical anti-fatigue industrial matting assists in reducing employee fatigue as well as heat loss and sound due to being 9.5mm thick. They have a microcellular vinyl construction which provides excellent comfort and the pebble pattern gives non-directional traction. A brilliant feature of the mats is the four bevelled sides which minimise trip hazards, making them a lot safer and helping to avoid incidents that can increase employee absenteeism. 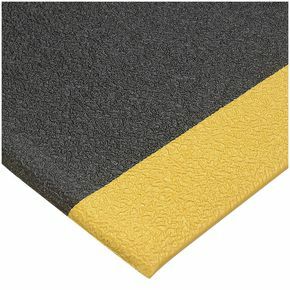 They are supplied in two colours; black or black with yellow edges which provide extra safety by highlighting the edge of the matting. Our economical anti-fatigue industrial matting will help reduce stress to your employees' minds and body's creating better working conditions; they are available in a choice of four lengths; 910, 1000, 1520 or 18290mm and a choice of two widths; 610 or 910mm. They also benefit from a 12 month guarantee.